Eighteen months after its ambitious three-way merger, CMS is now setting its sights on the U.S.
CMS Cameron McKenna Nabarro Olswang, which was formed just over 18 months ago after a three-way merger, is now turning its attention to a tie-up in the U.S.
A U.S. merger is a priority for the firm, as it would give it the international clout it seeks, he said. And given CMS’ financial services, tech and energy focus, New York, Silicon Valley and Houston are particularly important centers for the firm, he said. According to a former partner, a U.S. tie-up has always been a target and is also likely to have been a driver behind the 2017 merger of CMS Cameron McKenna, Nabarro and Olswang. 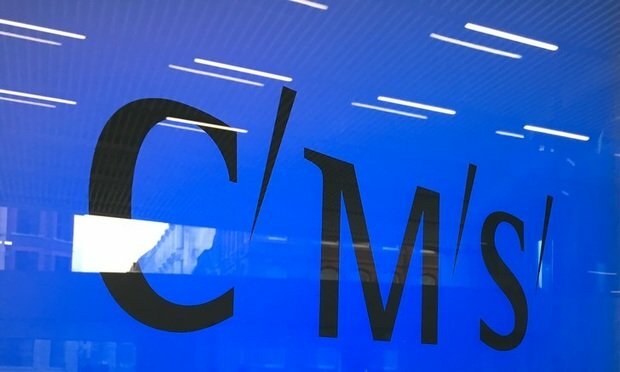 The U.K. side of the business is now a big player in the market, and CMS will look for a U.S. firm of equal worth, the former partner said. The key question is how such a merger might take shape—whether a fully integrated tie-up, a Swiss verein deal or as a more loosely integrated addition to the CMS global network, which currently operates as a European Economic Interest Grouping. While names of potential partners are beginning to circulate in the market, CMS’ unconventional structure may present a challenge in securing a suitable U.S. target. “The problem for modern-thinking firms—with remote working, hot-desking, a more diffuse client model [and] an emerging tech tilt—is that the further you go in that direction, the harder it is to shoehorn that into a U.S. business,” the consultant said. But few would argue that CMS, which met with widespread skepticism when it undertook a merger of three separate firms, has confounded expectations. Post-merger fallout has been kept to a minimum, with the recent departure of a real estate team a rare example of issues raised by the combination. Last year’s merger created a firm of nearly 2,500 lawyers in the U.K. and more than 4,500 around the world, with combined revenues breaking through the £1 billion ($1.28 billion ) mark in its first year, and like-for-like profitability up almost 20 percent. The cost of trussing together the three firms has been high—Millar cites a total bill of £45 million ($58 million), which the firm will pay during this year and next. But he claims the combination has helped the firm secure “a bigger share of the wallet,” with roles on an increasing number of what he describes as “headline” deals. Mergermarket stats for the first three quarters of 2018 bear this out, with the firm topping the U.K. M&A rankings by volume and rising from 43rd in last year’s Q1-Q3 value rankings to ninth this year, after 92 roles worth a combined $32.4 billion. “It’s gone fantastically well—people are excited about what the firm is achieving, and at the partner level there’s a great deal of mutual respect for the aspiration,” Millar said. Despite this, “most people will now say that [the process] was remarkably smooth,” Millar said. Real estate head Ciaran Carvalho, who as Nabarro senior partner also played a central role in the merger talks, also remarked on how smoothly the merger occurred. In addition to the 10-strong real estate team that left for Fladgate, departures have included litigator Ian Felstead, who joined Latham & Watkins last year, while earlier this year IP partner Kevin Cordina left to join Olswang’s former interim CEO Michael Burdon at Simmons & Simmons. However, incoming hires have included Norton Rose Fulbright financial services regulatory partner Elisabeth Bremner, Dentons transport partner David Moore and Sedgwick insurance partner Tristan Hall, among others. Carvalho also noted that the combined firm has been able to get work that each of the legacy firms would have found harder to win on their own. The firm has won new post-merger work with Metro Bank, fiber broadband company CityFibre and global theatre giant Stage Entertainment and was last year appointed to BP’s new panel. It also was appointed as The Crown Estate’s sole legal provider for its £2.5 billion ($3.2 billion) regional retail portfolio. Executive partner and former Olswang CEO Paul Stevens, another architect of the tie-up, added that part of the rationale behind the merger was to invest time, energy and resource to develop better ways of serving clients through tech, processes and new approaches. “We’re on a path to achieving that,” he said. While the firm continues along that path, Millar is keen to stress there is no rush to make the next strategic move.